This beautiful black skirt has got a gorgeous embroidered floral detail with a few sequins. The skirt ends with a black satin hem. Only worn once as I realised I rarely ever wear black. Excellent condition. Sequin accents and beaded. 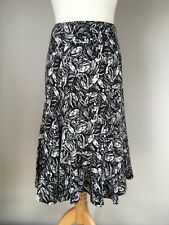 Stunning individual designer skirt. In red cotton fabric. Lace Effect Black Wiggle Skirt. UK Size 12. length 64 24.96. Back Zip Fastening. 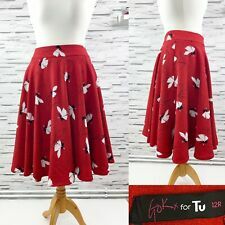 TU Ladies Skirt. A-Line Flare Style. Floral Pattern. Red and White. Length; 24". THIS IS A LOVELY DENIM SKIRT. THE SKIRT FALLS JUST ABOVE THE KNEE. 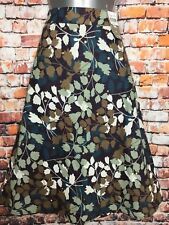 THE BACK OF THE SKIRT HAS 2 POCKETS AND THE FLORAL PATTERN CONTINUES ON THE BACK. IN MUSTARD/BLUE/BURGUNDY. Flippy linen blend skirt from Tu (Sainsburys) in a size UK 14. Fishtail style hem. Falls just below knee length. Elasticated waist band Blue, pink purple ditsy floral print. Blue denim floral midi skirt. Length: 27". Waist: 28". Tu Skirt - Size 12. Navy Blue background with a white floral pattern print. Length approx. Used but in very good condition. Materials: 100% Polyester. Hidden zip fastening in the back. From a non-smoking household. BNWT TU Size 8 Short Full Flippy Skirt Red White Blue Yellow Floral Pattern Side Zip with 2 Pockets RRP £16 Condition is New with tags. Dispatched with Royal Mail 2nd Class. Silky Feel Material. Knee Length. Black/Red Multi(see separate photo of nearest red as not showing properly in skirt photos).